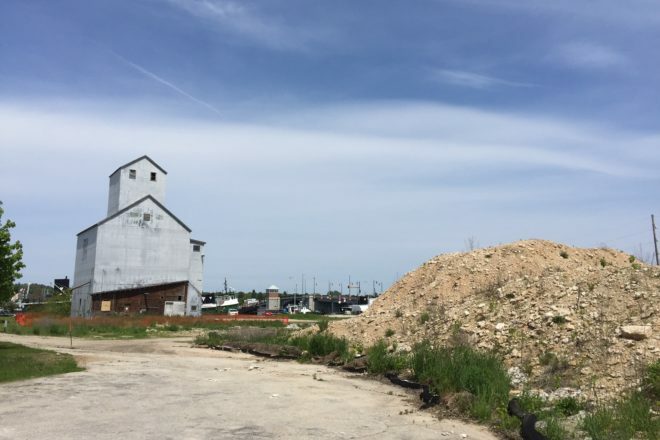 Dirt piles were moved to Sturgeon Bay’s west waterfront site in 2015 and remain there nearly three years later. Photo by Myles Dannhausen Jr. The Teweles and Brandeis Grain Elevator will move to its new home on the east side waterfront Thursday, March 29. The Sturgeon Bay Historical Society purchased the Granary from Kiesow Enterprises with plans to move it to the east foot of the Oregon Street Bridge. The Sturgeon Bay Common Council approved the move at its regular meeting March 20, on the condition that the movers acquire all the proper permits from the U.S. Coast Guard and Wisconsin Department of Transportation. They also must coordinate the move with local safety officials, Bay Shipbuilding, and American Transmission Company, which will have to temporarily take down an overhead line. The move will require the Oregon Street Bridge be closed from 3 am – 6 pm. Though the move will only take a couple of hours to complete, the historical society requested a large window for preparation and unexpected issues. The council discussed the future of the dirt piles that have sat on the west waterfront since 2015. The piles, made of materials dug for the stormwater basin by CVS, were transported to the site by Bayland Builders. The material was originally planned to cap contaminated soil on the site and to lift a proposed hotel out of the flood zone, according to City Administrator Josh VanLieshout. City staff and council members do not know who actually owns the piles. The council and mayor Thad Birmingham instructed VanLieshout to find out who owns the piles and get estimates for the cost to move the piles off the property. “If it turns out we don’t own the dirt that would be the easiest and cheapest. We could just order them to get it off the site,” Birmingham said. Alderwoman Kelly Catarozoli produced an email from then-City Engineer Tony Depies to the council and staff dated July 22, 2015. In that email Depies said Bayland Builders was confident the hotel construction would begin in August of that year. Bayland requested they be allowed to store fill on the lot, and agreed to remove the fill from the site if not used for the project in 2015. Catarozoli had asked VanLieshout prior to the meeting if the city had a copy of an agreement with Bayland. “I don’t think I’ve ever seen an agreement with Bayland Buildings with the City of Sturgeon Bay,” VanLieshout said. The council approved the purchase of a 2018 Ford Explorer Police Interceptor from Jim Olson Motors for $32,856. The council discussed, but did not vote on, a proposal to spend $172,960 on a HM-420 Aquatic plant harvester. The used harvester the city owns is damaged and frequently in need of repairs, according to City Engineer Chad Shefchik. Shefchik said the city will no longer harvest weeds for citizens closer than the pier face. Residents will have to harvest weeds and arrange for pickup at the end of their pier or on land. Water weed program is permitted and authorized by the DNR for navigational purposes. The harvester would not arrive in time for use in 2018, as Shefchik said lead time for the machines is typically three to five months.